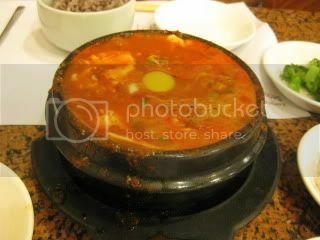 I've been in a mood for jjigae (Korean soup) lately. 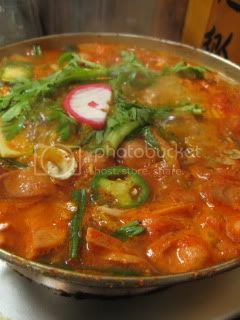 Seafood Sundubu jjigae at Seonbukdong on 6th St is really outstanding. I've had their Samgyetang also and it's also very nice. Jason and I have come here a few times and we really love this place. It's a good place for a "hangover cure" visit especially since they don't serve alcohol or allow byob. This restaurant is an authentic 韓国食堂 (Korean diner) to me. Jason had breaised mackerel. 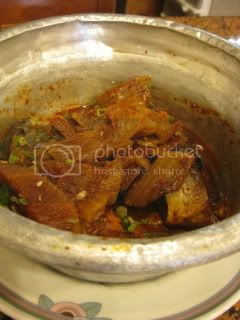 It was also a very interesting dish with fermented vegetables inside. He loved it. The other night, we ordered budae jjigae ("military" soup), which is a popular "junk" style jjigae with ramen, spam, sausage, etc., at Chunju Han-il Kwan (also on 6th St.). I'm not particularly a big fan of budae jjigae in general but I got kind of excited that they had it in the menu and it seemed to be a very popular item in the restaurant. I think their version had very "fermented" (pickled) flavors from the aged kimchi and it was different from what I had experienced before. 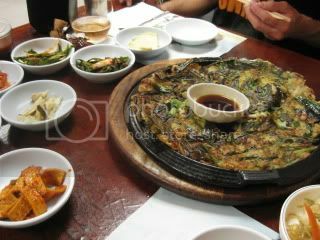 Their seafood pajeong (pancake) came in a sizzling skillet and quite nice.